Puree the tomatoes in a blender fitted with a steel blade or food processor. Empty thecontents through a sieve into a pitcher. Add water, cardamom, saffron threads, lime juice, and sugar. Stir thoroughly and pour into serving glasses with ice cubes. My mom is the inspiration behind this recipe. She loves to make homemade juice, because it is fresher and healthier. 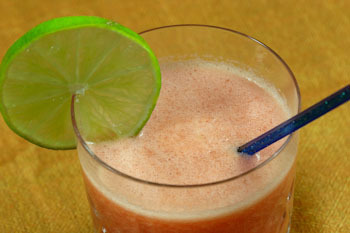 This juice is a surefire way for kids to get their daily serving of a vegetable or fruit. Some people say tomato is a vegetable while others say it is a fruit. Either way, it’s a great antioxidant!